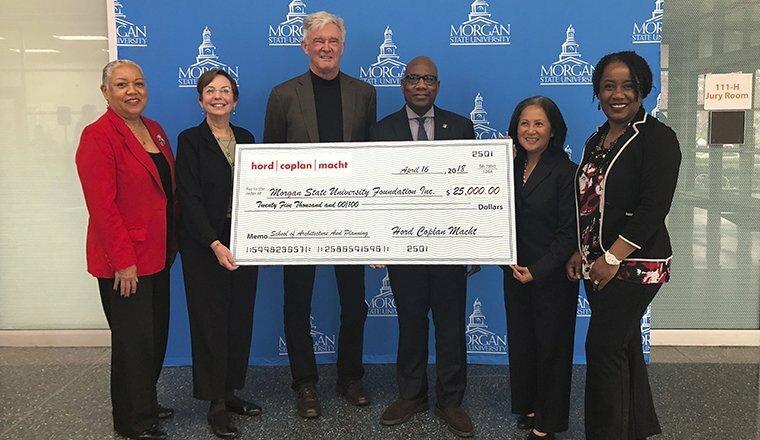 Hord Coplan Macht is excited to announce the establishment of the Hord Coplan Macht Scholarship Fund at Morgan State University. The $5,000 annual commitment, for a five-year term, will help offset educational costs for two students in the School of Architecture and Planning, one majoring in Architecture and one in Landscape Architecture. This fund celebrates Hord Coplan Macht’s 40th anniversary and the company’s long-standing relationship with Morgan State University’s School of Architecture and Planning. Together, the two entities have formed a successful mentorship and internship program, offering numerous students internships, employment and growth opportunities since its inception. “Our relationship with Morgan State University has been incredibly meaningful. The students we’ve met through the program have shown us that inspiration travels both ways, from mentor to mentee and vice versa. We are delighted to offer this opportunity and look forward to helping develop the next generation of design talent,” Hord Coplan Macht founder and Principal Carol Macht said of the scholarship fund. Scholarships will be awarded to qualified students based on academic achievement and demonstrated financial need. “HCM is a true advocate for educating and preparing young students to lead the built environment professions. They have supported initiatives and have volunteered valuable time to ensure diversity and inclusion in practice. Morgan State University School of Architecture and Planning is very grateful to HCM for their impact on students’ lives,” said Morgan State University Architecture and Planning School Dean Maryanne Akers.